What Gun Offenses Could You Be Charged With in North Carolina? Although the United States Constitution guarantees the right to bear arms, it is not an absolute right. Both North Carolina and federal laws regulate the sale, possession, and distribution of guns. In some cases, a person can be completely barred from owning or possessing a firearm. If you are facing weapon charges in our state, you could be charged with a serious misdemeanor or felony charge that could carry a lengthy prison sentence if convicted. In addition, you would have a permanent criminal record that could affect many aspects of your life after you complete your sentence. To avoid these possible harsh penalties, you need to retain an experienced criminal defense attorney as soon as possible to fight for your rights in court. Concealed weapons with no permit. It is illegal to carry a concealed weapon without a permit outside of your home in our state. Concealed weapons include guns, stun guns, brass knuckles, bowie knives, daggers, and other similar deadly weapons. A first offense is a Class 2 misdemeanor, but a second charge for carrying a gun or pistol is a Class I felony. Possession of a gun by a felon. In North Carolina, it is illegal for a convicted felon to purchase, own, or have a firearm in his custody, control, or possession. This is a Class G felony. Possession of a weapon on school property. It is a Class I felony to possess or carry a gun, pistol, or other firearm—whether concealed or carried openly—on school property or to an extracurricular event. A school is broadly defined and includes elementary schools through college. If the gun or other firearm is intentionally discharged, the person could be charged with a Class F felony. Carrying weapons where alcohol is sold. People are prohibited from bringing a firearm or any other weapon to a bar or other establishment where alcohol is sold or consumed, or to a location where admission is charged, such as a concert. This offense is a Class 1 misdemeanor. Purchase or possession with a domestic violence order. If an individual is subject to a domestic violence order, he is prohibited from purchasing or possessing a firearm or ammunition as long as this order is in effect. Violation of this law is a Class H felony. 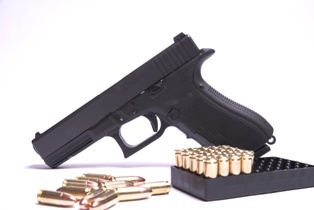 Committing a robbery with a firearm or other dangerous weapon is a Class D felony. Discharging a firearm within an enclosure is a Class E felony or a Class F felony if it was discharged to incite fear. Altering, destroying, or removing a serial number from a firearm or possessing a firearm with no serial number is a Class H felony. Allowing young children to use a firearm is a Class 2 misdemeanor. Selling a weapon other than a handgun to a minor is a Class 1 misdemeanor while selling a minor a handgun is a Class H felony. Assaulting a law enforcement, probation, or parole officer, or individual who works at a state or local detention facility with a firearm is a Class H felony. If the person being assaulted is a governmental official or employee, company police officer, or campus police officer, the crime is a Class F felony. Have you been arrested for a firearm offense in Charlotte? Call our office today to schedule your free consultation with our experienced criminal defense attorneys to learn how we can help you build a strong defense to the charges you face.